Sadler’s Wells 8oz reuseable hot/cold drink travel mug. 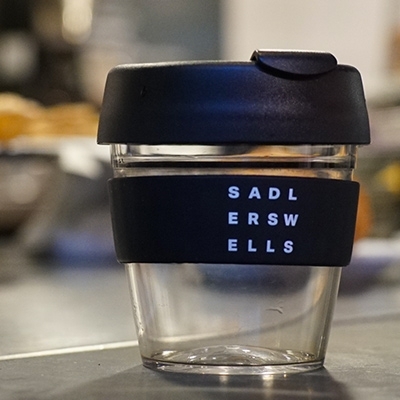 Lightweight, stylish, eco-friendly and dishwasher safe with a BPA free, non toxic lid manufactured from polypropylene. Tough, durable, fully-tempered soda-lime glass. The sealable lid is recyclable and splash-proof.